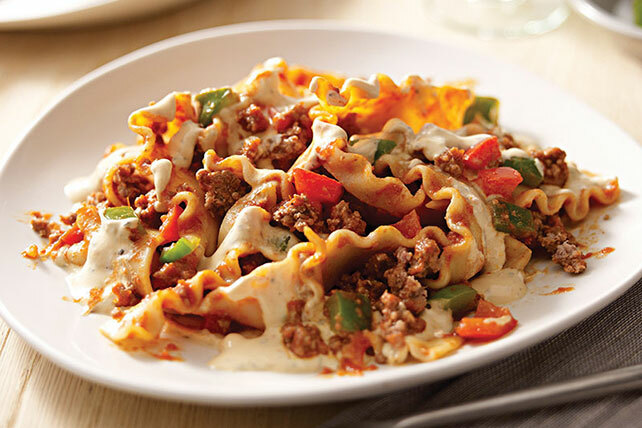 Cook this freewheeling skillet lasagna on the stove! No need to crank up the oven for this Easy Skillet Lasagna with broken noodles and other fixin's. Brown meat with peppers in large deep nonstick skillet; drain. Stir in sauce and water. Bring to boil. Add noodles; stir. Cover; simmer on medium-low heat 18 to 20 min. or until noodles are tender, stirring occasionally. Mix remaining ingredients until blended. Add to ingredients in skillet; swirl gently. Remove from heat. Let stand, covered, 3 min. Traditional lasagna can take up to 2 hours to prepare. This skillet version takes less than 1 hour. Substitute 3 cups campanelle pasta for the broken lasagna noodles.